I never saw THE MASTER on the big screen. I missed the 70mm screenings in Dublin by days, and the big print never made it to Edinburgh. Apparently the London cinema that had first dibs on it had booked their best projectionist to handle it, but decided to save a little money by letting a less experienced employee take care of the press screening. He wrecked the print. 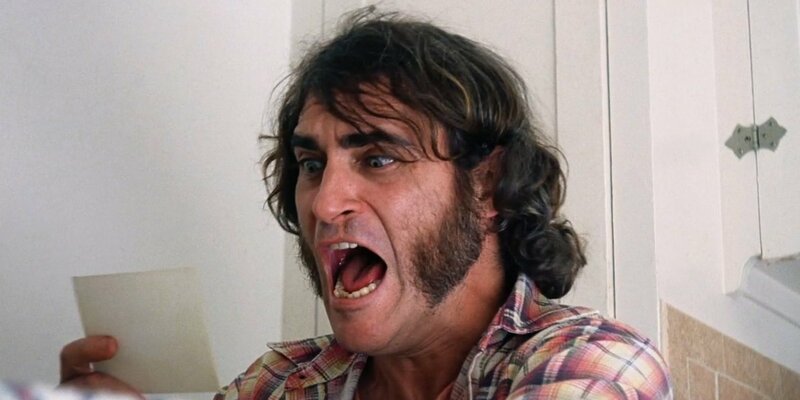 And I wasn’t completely sure I was going to bother with seeing INHERENT VICE in 35mm — Fiona, influenced by bad reviews, wasn’t interested, and a few friends reported disappointment and bafflement. I let the Cameo screenings slide by. But, on a whim, I popped along to Filmhouse 3 after work yesterday — and I really, really liked it. But it’s put me in quite a strange frame of mind. Vuvuvungle. Ilm. Fffffiip. Another thing that had put me off slightly is that I had read the book, and found it extremely slight by Pynchon standard. Not just thin physically — The Crying of Lot 49 is also slender — but conceptually. It seemed filmable, but a director of Paul Thomas Anderson’s stature, should have selected a LESS filmable book and then grappled with its challenges/impossibilities. I mean, we’d already had Altman’s THE LONG GOODBYE, which maybe didn’t overtly male Philip Marlowe a stoner, but by casting Elliott Gould at least implied as much. And then THE BIG LEBOWSKI made it literal. Pynchon’s “Doc” Sportello seemed doubly redundant, and more so as a movie character. Trahumph. Crrrrk. Since seeing the movie, I have a Tourettes-like urge to make silly noises, rather in the manner of Jerry Lewis in WHICH WAY TO THE FRONT? when he can’t handle rejection. Vooolf. Burke Stodger, Japonica Fenway, Puck Beaverton, Sauncho Smilax… Wrrrab. Sporf. Maybe it’s the onslaught of Pynchonian names, even more overpowering on the screen, where an actor has to actually introduce himself as Dr. Threeply. Giddiness sets in. 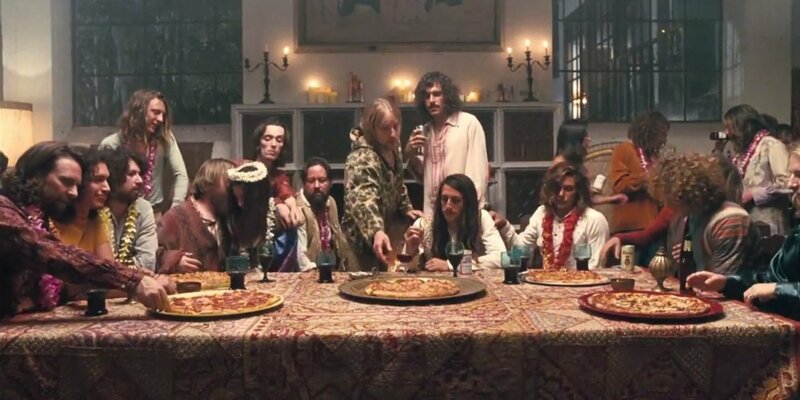 Watching lots of drugs being consumed doesn’t usually produce any vicarious effect in me except perhaps boredom, though the fast cutting in the brownies scene in I LOVE YOU, ALICE B TOKLAS did make me feel kind of sick. FEAR AND LOATHING IN LAS VEGAS, watched on a single glass of wine, did produce some kind of elation, and I kind of caught Brad Pitt’s mania from TWELVE MONKEYS. Preet. Prott. Hespelafigo. Luckily there was nobody at the bus-stop after the film so I could Vrrroop and Pleck and Spraddlekoffup to my heart’s content. I will discipline myself. No more eruptions. Anderson’s film is flawed — I don’t mean that it’s impossible to follow — I actually understood most of it better than I understand THE BIG SLEEP, and I suspect a repeat viewing would clear up the remaining mysteries (which are not insignificant: what the hell was Bigfoot Bjornsen trying to achieve with the stolen drugs?). But there are plainly too many two-hander scenes in which Joaquin Phoenix (very funny) sits down with an informant and gets told some more plot. In one lengthy exchange over a canister of nitrous oxide (which literally induces laughter here, something I understand to be pharmacologically inaccurate), Anderson serves up the exposition in a pair of closeups against featureless white walls in a tiny cubicle, until I felt suffocated of all visual stimulation (kind of like the incomprehensibly long two profile shots outside the church in KILL BILL: death by understimulation). But those white walls showed up the grain nicely. I wasn’t sure how nostalgic I felt about celluloid. When the censor’s certificate came on at the start, scratched to buggery and out of focus, I thought, “Oh, I haven’t been missing THIS.” But that dancing pointillist patina… a film that so successfully evokes its period would be impossible on digital, even with all the colour manipulation available. This experience is akin to time-travel. Oh yes, the movie’s flaws. It’s overlong and overshoots its climax by what feels like twenty minutes. But it has Owen Wilson, the heart of the movie. (The melancholy of the first scene, with the protean Katherine Waterston — one of a regiment of scratchy-voiced chicks rocking the natural look — sets up the undercurrent of sadness that Pynchon gets at in his prose sometimes but never in the actual SCENES of the novel, so it’s a brilliant piece of adaptation to me). 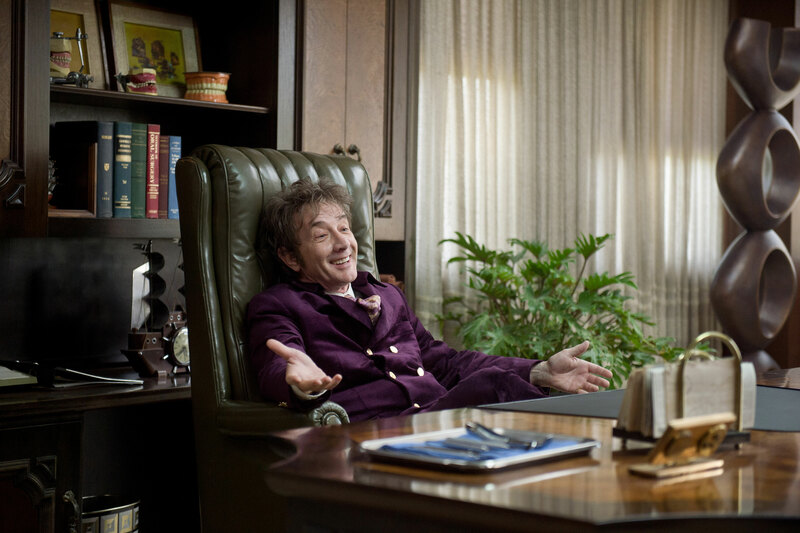 It has Martin Short, channelling Burgess Meredith at his most Creep Factor 11, filtered through a layer of Phil Spector. Genius. I mean, NOBODY does Burgess Meredith. Short has a history of crystallizing the madness of whatever film he’s in, presenting it in a purer, more intoxicating form (MARS ATTACKS!). 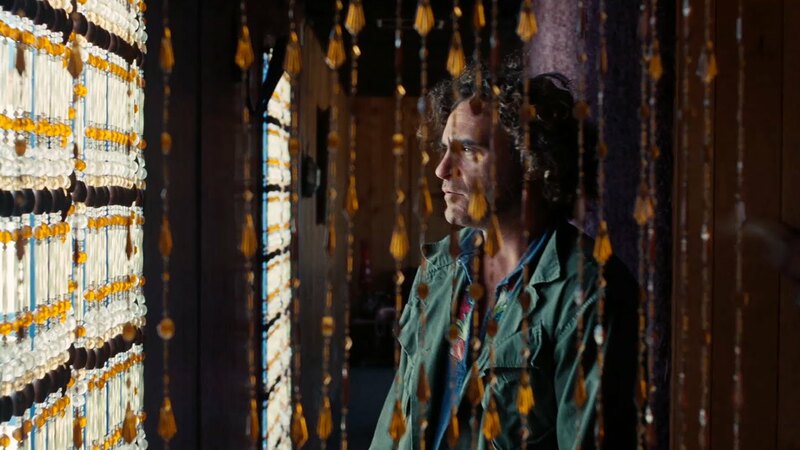 Josh Brolin, presenting the Tragical Comedy or the Comical Tragedy of Whiteman (to quote the Robert Crumb cartoon: “I must retain this rigid position or all is lost!”) Benicio Del Toro, underselling his quirkiness, which makes it even more striking. Some guys I don’t know so well are astounding: Jeannie Berlin, Michael Kenneth Williams, Jefferson Mays. And, in the “Where you been?” category, Eric Roberts and Martin Donovan. This spaced-out Rockford Files won’t appeal to everybody. As I watched, I was wondering if my mum would like it. She enjoyed THE BIG LEBOWSKI… But this is more intense, peculiar, and dysfunctional. But it also has more of a purpose. Anderson, unlike Altman or the Coens, finds Sportello’s moral code admirable, I think. And the film’s elegiac quality, creeping up on you unexpectedly, is something far out of the register of its predecessors. Pynchon’s best bit in the book is the foreshadowing of the internet — it’s when the whole enterprise belatedly acquires some gravitas and atmosphere. Anderson deletes it entirely — but he captures the gravitas, and enhances the atmosphere.